Are Our Homes Contributing to Climate Change? For many of us, the idea of living an environmentally friendly lifestyle can be a difficult challenge, but one we are completely willing to take on. Deep down, we know that the lifestyle that many of us live is leading our planet down a dangerous path. Therefore, we make whatever small (and sometimes not-so-small) changes that we can. However, when it comes to the homes that we live in, there are often a number of substantial climate change contributors that we fail to think of. If you monitor your carbon footprint, you know things in your home can be a profound negative mark against you. Sometimes they are easy things to update that have simply slipped our minds; other times they are big things that may require significant work to fix. When we discover these major climate change contributors in our homes, oftentimes we immediately want to go into demolition mode and make changes. Ultimately, however, becoming aware of the things in your home that contribute to climate change is the first step in addressing any issues. Here is a short list of things you may be forgetting about when it comes to greening up your home and reducing its climate impact. The HVAC system in your home is typically a substantial user of either electricity or natural gas. Unfortunately, excessive consumption of either of these isn’t really sustainable, and both ultimately contribute to climate change. Air conditioners alone are estimated to release over 100 million tons of carbon dioxide every year in the United States, plus dangerous refrigerants. That number doesn’t take heating into account, though many estimate the tonnage to be similar. Fireplaces also have the potential to be significant contributors to climate change, especially in older homes where standard wood-burning fireplaces are still a mainstay. Wood-burning fireplaces can contribute to climate change through the creation of toxic particulate matter, carbon monoxide, nitrogen oxides, and methane. They can also be a home hazard if they are not properly cleaned and maintained. Fortunately, there are a number of cleaner fireplace alternatives that can help reduce the climate impact. One significant way to greatly reduce the energy used in heating and cooling your home — whether through a fireplace or otherwise — is to consider utilizing green energy. 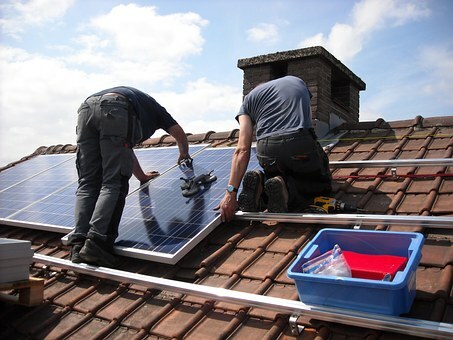 There are a variety of ways to do so, but the most popular is through the installation of solar panels. Solar panels have been linked to both a reduction in greenhouse gas emissions (which are a big contributor to climate change) and your electric bill. It is a win-win situation! Arguably the most difficult aspects of managing your home’s climate change contribution has to do with the structure itself. These issues are easiest to deal with when building your own home; however they can be done post-build if desired. Oftentimes, post-build changes require significant time and monetary contributions, but they can have lasting impacts. Accounting for things such as home orientation, size, building materials, and insulation can have a profound impact not only on the home’s climate change contributions but also on its ability to regulate temperature without raising your energy bill. For instance, taking the time to properly insulate your attic with quality material can save upwards of $600 per year. Likewise, orienting your home towards the sun can drop your heating and cooling costs, saving energy in the process. The types of materials that are used in the construction of your home can also have an impact on how healthy your home is. For instance, things like asbestos are still used in some construction materials, and U.S. imports of asbestos have risen in 2018. Asbestos and other toxic materials in the home have been linked to a number of serious illnesses that greener options may be able to avoid altogether. Home electricity use is another climate impact that many of us forget about when going green. Luckily, electricity use is perhaps one of the easiest changes to make in your home. Even just upgrading your old appliances to Energy Star rated ones can make a profound difference in your home energy usage. As a green-minded person, you have likely heard that energy-efficient light bulbs consume up to 80 percent less energy than normal ones. Though you pay a bit more for them upfront, they often last longer and reduce your energy bill enough that they are completely worth it — some estimate up to $125 per bulb saved! If everyone changed to these bulbs, experts estimate that we’d save the equivalent emissions as removing 10 million cars from the road. We often forget that our appliances are using energy when plugged in, even if we’re not actively using them. The average home is powering 65 idle devices while the homeowners are away or asleep! This “idle load” translates to approximately $165 per household per year, or about 50 power plants worth of electricity. Climatic change is a incredibly significant problem facing our world today — a problem that, unfortunately, not many leaders are fighting for. This means much of the work to advocate for climate change legislation and address issues that we can manage falls to us. Starting with your our home and life is a great way to make a difference. Taking steps to reduce your home’s contribution to climate change can be as intensive as you are able to take on. You can make small changes such as unplugging appliances that aren’t in use, more substantial changes such as installing solar panels, or major changes such as upgrading your insulation. Once you have your home running economically, it allows you to expand your reach into other parts of your life, next — whether that be at work, at school, or even while traveling the world — but all of that will come in time. Until then, best of luck out there! BrookeFaulkner Brooke Faulkner is a mother of two and wilderness enthusiast. When she's not writing, she can usually be found zipping around the mountains on her ATV.